Asparagus is often seen as a refined vegetable due to its price to purchase. However this is because it is quite labour intensive to grow and requires more times and expertise to cultivate compared to many other types of vegetables. Asparagus has a very distinct intense flavour which is enjoyed and loved by many. You can find it in many different colourings. 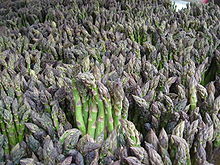 French asparagus for example is purple, British and American asparagus is green, Dutch and Spanish asparagus is white due to the fact that it’s grown beneath the soil and it is cut just as its tip emerges. So if we are able to eat asparagus, then can rabbits eat it as well? Let’s take a look at its nutritional data to find out more about this fascinating vegetable. In particular we are interested in its starch, sugar, phosphorus, calcium, and acidic content as these are the kind of nutrients that affect rabbits the most. As you can see Asparagus is quite acidic and contains quite a bit of phosphorus. However it does contain a hint of fibre. This means that rabbits can eat asparagus, but do feed it to them cautiously and not too much at one time. A stalk or two once a week should suffice to ensure that they dont eat too much of it. Too much asparagus could cause stomach problems for your rabbit due to their acidic nature. So if you have seen that they can eat asparagus and did’t understand why, I hope this post has been helpful in explaining why asparagus is fine for bunnies to eat.